Today marks 21 years since the passing of the woman that former Florida governor Fuller Warren dubbed "the First Lady of South Florida Theatre," the legendary Ruth Foreman. She was 81. Mrs. Foreman produced theater in Florida for about 40 years... Her productions won many local theater awards. Her productions created the environment that inspired such awards - indeed, it's safe to say that without Ruth Foreman, there would be no theatre scene in South Florida. And it's not only about putting on plays: Ruth always had workshops and classes going on, as well as a talent agency to help her students land work in the occasional movie or commercial shot in South Florida. 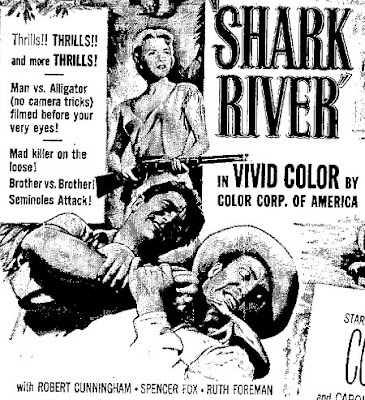 She has one film role to her credit: 1954's Shark River. Foreman more or less gave birth to the South Florida Theatre Scene in 1949 when she and her husband took over the Roosevelt Theater in Miami Beach. She took to calling it "The Lemonade Theater," because that's what she served during intermission. In a 1988 interview, she told Lisa Gibbs of the Miami Herald that the first two years of rent was paid by no one less than Howard Hughes. "When I was a junior high school student on Miami Beach, Ruth was running an acting school for kids on Arthur Godfrey Road (next to the Roosevelt Theatre). Howard Hughes had an office in the same building." Originally a first-run movie house, it wasn't long before she started putting on plays, starting with kids shows by her Pied Piper Players, and other projects. Borscht Capades was the creation of Mickey Katz, who took the show around the country. His co-star was his 17-year-old son. The show moved on to New York, and the son went on to great success as Joel Grey. 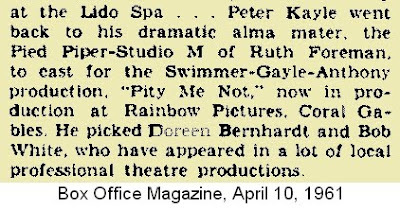 The Roosevelt was presenting plays as late as 1968, when Don Ameche and Robert Q. Lewis performed in The Odd Couple, but by 1955 Ruth had already moved on to her next venue. The Roosevelt eventually went back to playing movies - dirty ones. It closed as a theatre in the 80's, and is now a thrift store. 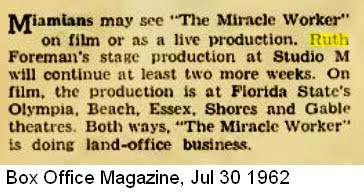 From the mid 1950s and into the 1960s, Foreman operated out of Studio M in Coral Gables, producing very serious theatre. George Keathley was the director; he went on to direct on Broadway, and to become the Artistic Director of the Kansas City Repertory Theatre. 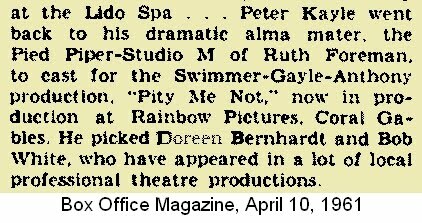 Studio M produced the world premiere of Tennessee William's Sweet Bird of Youth on April 16, 1956. George Keathley directed Margrit Wyler and Alan Mixon in the lead roles. The playwright was on the scene, tweaking a play that had been titled The Enemy: Time only a few months before. "All the while this work has been in rehearsal, it has also been undergoing continual changes in dialogue and structure, even in basic theme and interpretation of character. At times Studio M has looked more like a printing press than a theatre, with stacks of re-writes, newly mimeographed, covering the stage and actors looking like a group of dazed proof -readers"
- Tennessee Williams, in the program notes for Sweet Bird of Youth at Studio M.
Williams spent two more years working on the script. In 1959, Elia Kazan cast Paul Newman and Geraldine Page in the Broadway production. Alan Mixon was a South Floridian who made his stage debut at Studio M, in 1954 , before landing Sweet Bird of Youth. Following the advice of William's agent, Mixon went to New York a short time later, and went on to perform in numerous Broadway productions, films, and TV shows. He was also cast in a number of plays on Broadway by Williams, and became known as a premier interpreter of his work. "It must have been in the 1960s when I first met Ruth. A once-famous actress friend of mine was appearing at Ruth's "Studio M" theater in Miami, and I drove from Ocala, FL, to see her and the play. Back then there almost no professional theaters in Florida aside from the touring houses. Seeing the show, I was knocked out by the professionalism and courageous spirit of Ruth Forman -- and I met her that night and told her so." "Years later I created the Caldwell Theatre Company in Boca Raton and often commiserated with Ruth about the challenges of keeping professional theater afloat. The last time I saw her we were in Tallahassee begging politicians to fund the arts, theater in particular. I am a proud recipient of the Ruth Foreman Award." "I remember seeing a production of GLASS MENAGERIE at Studio M, a theatre on Bird Road that Ruth was involved with. It was directed by George Keathley and featured Anne Meacham and Alan Mixon. Although, I never took classes with her, and I never really met her personally during those years, that play had a profound effect on me." Like Alan Mixon, Ann Meacham would become closely associated with many later productions of his work. And the plays kept coming. The movie starred Tony Anthony, who later moved to Italy, where he landed starring roles in spaghetti westerns. He is also credited with bringing back the 3-D concept back to low budget films in the 1980s. The film is also known under the title Without Each Other. Ruth took care of her theatre family; when Tom Blaise, a struggling young actor, announced that he was marrying one of her acting students, Ruth threw them a party. After 8 years, she left the small space on Bird Road behind, but kept producing shows. In 1966, she was still producing children's shows in borrowed or rented spaces, but that was soon to change. And so was the course of South Florida Theatre. The North Miami Playhouse was founded in 1967, and was located at 1603 NE 123rd Street in North Miami. It served as a home for the Pied Piper Players, and she continued teaching courses related to theatre. But it also served as a home for a new entity: The Ruth Foreman Theatre. Back then, professional theater in South Florida consisted of the Coconut Grove Playhouse, the small Ruth Foreman Theatre in North Miami, the black theater company M Ensemble, Boca Raton's Caldwell Theatre Company, a couple of dinner theaters and touring Broadway shows. And she still kept in touch with local film companies. 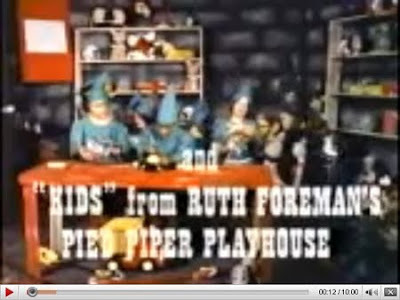 In 1972, R&S Film Enterprises released Santa and the Ice Cream Bunny, filmed mostly at Pirate's World in Dania, featuring the Pied Piper Players. Avi Hoffman had just graduated from the University of Miami when Ruth cast him in Clifford Odet's Awake & Sing in 1981. "This was my FIRST show out of UM. Ruth called me to ask if I would be interested in playing the lead role of Ralphie. Of course, I said "yes". The twist was that the show opened on TWO days and she was unhappy with the actor playing the role. I actually learned the entire part OVERNIGHT (ah, the folly of youth) and opened 2 days later to rave reviews. I didn't spend much time with her, but I remember her being sweet and very supportive." Her success continued as she moved operations to a 325 seat theatre at FIU, and became the resident company at the Bay Vista Campus. It came about at a meeting of the North Miami Mayor's Economic Task Force. Dr. Rose Foster, administrator of the Bay Vista Campus, heard Foreman talk about her children's theater, then at the North Miami Playhouse on NE 123rd Street. "I was giving a report on our children's theater and she was all eyes," Foreman said. After the meeting, they met to talk about a campus theater. The Ruth Foreman Theatre was conceived. In a fickle business where it usually takes three to five seasons to break even, the Ruth Foreman Theatre has done so three months before its second season begins, Foreman said. Within a few years, the company expanded with the creation of Ruth Foreman Theatre West, at the Sunrise Musical Theatre in Broward County. It relocated briefly to the Plantation Theatre after Sunrise was sold, and closed in 1988. Eventually, as FIU's enrollment increased, the university needed the space back, and informed the company that their lease would not be renewed when it expired expired in June 1989. After discussions with Miami Shores, Foreman eventually chose to relocate to Barry University, due partially to the failure of a bond issue that would have covered the costs of converting the Shores Theater into a live performance space. But Foreman maintained she preferred the university setting, and the proximity to the old space - and her subscribers. The Miami Shores Theater was eventually converted from a movie house; it is now home to the Playground Theatre. Foreman didn't live to see her theatre perform at Barry University. And half of her subscribers didn't follow the company to its new home. With growing money shortages and lacking Foreman's demanding standards, the company quickly foundered. "We could have survived have survived Ruth Foreman's illness and death. We could have survived the closing of the Theatre West. We could have survived the move to Barry University adn the loss of half of our subscribers, survived the wearying and expensive litigation over Ruth's estate." "We could have survived any one or even two of these things. But we could not survive all of it." Twelve years after her death, The Carbonell Awards created a special award in her honor. It was created after Kenneth Kay, upon receiving a Carbonell Award, used the occasion to remind the assemblage of her contributions to the South Florida theatre community. In 2001, the Ruth Foreman Award was bestowed on Jan McArt and Bob Bogdanoff. With over 50 years of producing theater, it's no surprise that so many people working in South Florida theatre started off with Ruth Foreman, or at least had a tremendous career boost by working for her. Her passion and drive gave birth to the South Florida theatre scene - sixty years ago.